Skilled hunters with an unparalleled skill at tracking enemies. 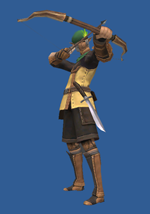 Experts at ranged combat, the Ranger uses his arsenal of guns, bows and crossbows to deal devastating damage to their enemies. Attainable upon completion of The Fanged One. 1	 Sharpshot 00:05:00 00:01:00 Increases the accuracy of ranged attacks. 10 Scavenge 00:05:00 N/A Search the ground around you for items. 20 Camouflage 00:05:00 Varies Grants you invisibility. 30 Barrage 00:05:00 N/A A single shot that can hit up to 5 times. 40 Shadowbind 00:05:00 Varies Roots the enemy in place. 51 Unlimited Shot 00:03:00 N/A Your next ranged attack uses no ammo. 75 Merit Flashy Shot 00:20:00 N/A Your next attack will generate more hate and ignore level difference penalties. 75 Merit Stealth Shot 00:20:00 N/A Your next attack will generate less enmity. 1 Widescan Scans the area for monsters, revealing them on the map. 5 Alertness Makes you less likely to be attacked by aggressive creatures. 10 Accuracy Bonus I Improves accuracy of physical attacks. 15 Rapid Shot Occasionally reduces ranged attack delay. 20 Resist Poison I Increases resistance to poison. 30 Accuracy Bonus II Further improves accuracy of physical attacks. 40 Resist Poison II Increases resistance to poison. 50 Accuracy Bonus III Further improves accuracy of physical attacks. 60 Resist Poison III Increases resistance to poison. 70 Accuracy Bonus IV Further improves accuracy of physical attacks. 75 Merit Snapshot Reduces delay for ranged attacks. 75 Merit Recycle Occasionally allows ranged attacks without consuming amunition. 1 Eagle Eye Shot 02:00:00 N/A High damage, long ranged attack. Ninja: A Ninja subjob to your ranger main brings many useful characteristics to the table. As a Ranger, you will be pulling mobs for your experience points parties and the added evasion and ability to cast Utsusemi: Ichi, and later Utsusemi: Ni, to absorb hits on the pull becomes extremely useful when preserving healer mana is so important for chaining mobs together efficiently. In addition, the Ninja ability Dual Wield allows rangers to equip more than one stat boosting melee weapon which can greatly increase ranged accuracy and attack power resulting in an increase in overall damage output. Warrior: Combining a Warrior's devastating activated abilities like Berserk and Warcry with the hard-hitting ranged attacks of the Ranger creates a damage-dealing machine that is matched by few other jobs. In this case, however, survivability is sacrificed for higher damage output, requiring the RNG/WAR to choose their pulls more carefully to avoid being hit when returning to camp. Camouflage Recast Reduces recast timer by 10 seconds per upgrade. Scavenge Recast Reduces recast timer by 10 seconds per upgrade. Sharpshot Recast Reduces recast timer by 10 seconds per upgrade. Unlimited Shot Recast Reduces recast timer by 6 seconds per upgrade. Rapid Shot Rate Increases activation rate by 1% per upgrade. Flashy Shot This ability ignores level difference and causes a high amount of emnity with your next shot. Each additional upgrade will reduce the recast timer by 2 minutes and 30 seconds. Recycle This Job Trait will occasionally allow the ranger to shoot without consuming ammo. Each additional upgrade will increase the activation rate by %5. Snapshot This Job Trait will reduce the delay between ranged attacks. Each additional upgrade to this trait will reduce the delay by an extra 2%. Stealth Shot After activating this ability, your next ranged attack will cause less emnity. Each additional upgrade to this ability grants -10 emnity. This page last modified 2010-03-20 15:52:08.